Taken directly from Tony Stark's lab, this armor suit was reverse-engineered and rebuilt by the Air Force's top scientists. They boosted its engine output, enhanced its hydraulic muscles, and added several of the military's most powerful weapons. Iron Man might be a one-man army, but this machine is built for war. While everybody's got the MU-scaled IM toys, only Wal*Mart is offering a series of 6" figures, all three of which are new sculpts. 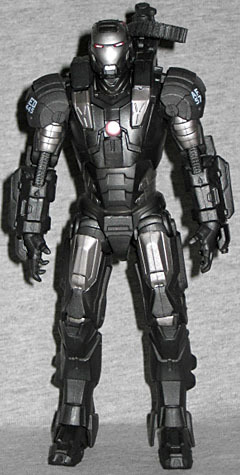 We did have an unofficial "War Machine" in the first movie line... which, coincidentally, was also a WM exclusive! But like we said in that review, they went to great pains to not mention War Machine anywhere on the packaging for the so-called "Stealth Operations Suit" specifically because they didn't want to muddy the waters for the second film. The figures are slightly more expensive than Marvel Legends, but still cheaper than DCU Classics. New War Machine stands 6¼" tall, and as we said, the sculpt doesn't have any re-used parts. Judging by the toy, War Machine is going to be a lot blockier than Tony's suit: he's still curved and anatomical, but the lines are rougher and more mechanical. Think of the difference between a sports car and a tank: same basic principle - generally flat, couple of wheels, lets you go forward quickly - but a huge difference in the overall design. This is clearly a piece of military hardware, while the normal Iron Man suit was designed for... looking really fast? I don't know, write your own end to our clumsy analogy. That's the future of interactive media! The proportions are decidedly skewed, as well. The legs in particular seem oversized, being quite thick and a bit too long - however, remember, these are things he's wearing over his normal human legs, and leaving room for jets in the boots and whatnot, the measurements become a bit inhuman. No worries, though. Articulation is up to par with other Marvel 6"ers, so he moves beautifully: balljointed ankles, double-hinged knees, swivel thighs, swivel/hinge hips, balljointed torso, swivel/hinge wrists, double-hinged elbows, swivel biceps, swivel/hinge shoulders and balljointed head. If all that weren't enough to shame every single toy Mattel has ever released (and it is), he's also got a hinge joint hidden in the neck that means he can actually look down, something the first movie toys couldn't even do properly. Speaking of things the first movie toys couldn't do properly, shoulder pads. Remember how the shoulder armor would continually fall (or sometimes fly) off the figures? Good news is that won't happen here. Bad news is it's because he has the same kind of ridiculous hinges as the comic-based War Machine. Well, crap! They hinge up, so if he holds his arms out to the side they look okay, but going forward or backwards screws things up royally. On the other hand, the flaps on the backs of his wrists are hinged, so they move back when he does the "repulsor blast" pose. The first thing I'm going to look for when War Machine shows up in the film is what color his electronics are. The 4" movie toy had versions with either red or blue for the eyes and unibeam, and no one was really sure which was accurate. This bigger version is done in red, but since they've just begun to show up at retail this week, we can't say for sure whether there's a blue variation, as well. Looking at the stock photos on the back of the packaging, you'd think War Machine was a rather monotonous grey, with some indistinguishable silver highlights - not so! That's just another example of the way Hasbro processes the hell out of all their promo shots: Transformers, Star Wars, GI Joe... it doesn't matter what line is, Hasbro puts out bad photos. He's not a grey mess, he's a great mixture of dark dark grey with prominent silver panels. More than that, there are identifying markings all over, just like an Air Force plane would have: FLTS, ED, 445 (the 445th Flight Test Squadron out of Edwards AFB); 001 (production number); AF (attack fighter); and 57 (the placement suggests the suit was built in 1957... or 2057). 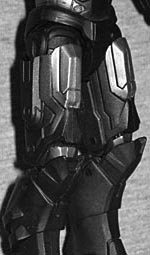 In a supreme attention to detail, there are even yellow and black hazard stripes on the guns near the elbows. Wow! Whoever designed this? Excellent work! 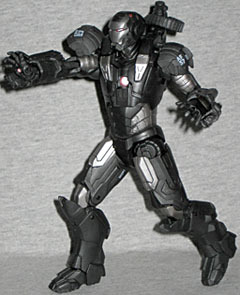 War Machine gets nice complement of accessories, beginning with three sets of hands. The ones he's wearing in the package are the splayed-finger "repulsor blast" versions, but you can also choose from open "gripping" hands or closed fists. All the hands have red repulsors in the palm, though the fists don't seem to have the white apps that the others do. The hands pull out at the wrist, with no trouble. War Machine's iconic main weapon is the shoulder-mounted Gatling gun, and it's not been skipped here. The gun is attached to a piece that allows it to both hinge and swivel, and the entire assembly is mounted on a rail that runs all the way across his back, allowing it to shoot over either shoulder. Why? Because versatility matters, that's why - if it were you, would you rely on only being attacked from one side? 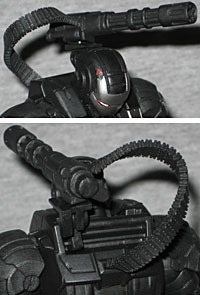 The set includes a flexible ammo belt that plugs into his back and the side of the gun. The belt is bendy enough that you can twist the gun around and point it down at the ground (the equivalent of holstering it) without unhooking anything. There's a bare spot on the toy's right shoulder that reveals a secret weapon: pop-up missiles. A section of the "band" that runs forward over the shoulder can apparently lift up and rotate to unleash small rockets. The toy can't quite do that, but it does offer swappable parts to simulate the "closed" and "open" positions. 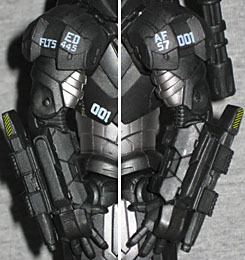 The Stealth Operations Suit was a decent movie War Machine stand-in, but this figure is the real thing. It's got a sharp design, great paint, plentiful articulation and unique weaponry. If you didn't get the old toy, don't worry about it: this is much better. 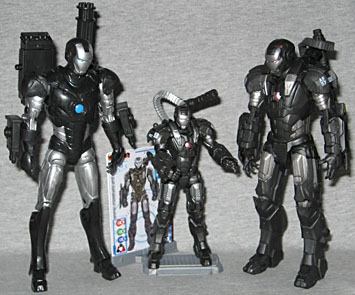 It's wonderful that we got a 6"-scale version of War Machine, now let's just hope he's not too hard for people to find. Mind you, it's not like the smaller guy is a bad toy - not by any means! Heck, if you get them both, you can pretend that the mass market release is a mock-up or model of the full-size suit built to test aerodynamics or something, then put on display in the lobby - you know how companies do. With these armored characters, the different scales are still compatible, and that's good value!